Many of us believe it’s bad for children to spend too much time indoors or looking at screens – but what does research evidence tell us about the possible mental health benefits of interacting with nature? A major new review of the evidence by Suzanne Tillmann and colleagues at Western University and the The Lawson Foundation in Canada finds there is a positive link – but the researchers say more work needs to be done, as Fran Abrams explains. We know that mental health issues that develop at an early age have the potential to burden people – and their families and friends – throughout life. And in recent years there have been lots of studies linking these problems to things that happen outside the family home: neighbourhood, environment, school. There have been an increasing number that have looked at positive effects – for example, the possible benefits of activities such as spending time in nature. The researchers wanted to know more about this last factor – so they decided to look more closely at the connections between the natural environment and children’s mental health. After searching academic databases, 35 studies published in English or French between 1990 and 2017, focused on children and teens ranging from nine months to 18 years, were included. Early adolescence was the most commonly-studied age, and three fifths of the papers came from the USA, UK or Canada. In those 35 studies there were a total of 100 individual findings. The papers looked at various kinds of activities which took place in natural areas such as parks, green spaces, water, gardens or forests. Fifteen focused on emotional well-being, 10 on attention deficit/hyperactivity disorder (ADHD), nine on overall mental health and nine on self-esteem, while others looked at stress, resilience, depression and health-related quality of life. So, what did the findings show? Overall, the review showed nature could have a positive effect on many outcomes measuring mental health. But only around half of all 100 reported findings revealed statistically significant positive relationships between nature and mental health outcomes, with almost half reporting no statistical significance. For some outcomes – ADHD, stress, resilience, overall mental health and health-related quality of life – there were more positive findings than there were non-significant ones. Studies which looked at emotional well-being, self-esteem, and depression had a greater number of non-significant findings than positive ones. Only one finding, on the impact of greenness on a subgroup of children, showed a negative effect. So, what did we know already, and what do we know now that we didn’t know before? We already knew nature had a significant impact on health – including physical, social and cognitive as well as mental health, especially when we look at the research on adults. However, here in this review we can see that there are quite a few studies with inconclusive results. What has this review added? We now know a little more about the effects of nature on the mental health of those under the age of 18. It has highlighted the need for more rigorous tools to measure those effects and the growth of research on children’s mental health and nature in the past five years. The research team have also devised a framework that might help future researchers by categorising papers into three groups based on types of nature interaction: ‘accessibility,’ meaning studies that look at mere opportunity to access outdoor space, ‘exposure,’ which means studies that look at incidental interactions with nature while taking part in another activity, and ‘engagement,’ which means a more direct engagement such as participation in a wilderness therapy programme. Overall, the messages are mixed. But what this review does demonstrate is the need for more in-depth and more rigorous research. Maybe we need a standard way of measuring the effects of being in nature, its authors say. Certainly we need to continue to look at this area to find out why the research shows such mixed results. But the researchers believe spending time in nature can make a difference – so it’s vital that policy makers and planners think about how we can provide opportunities for children and young people to have those experiences. Mental health benefits of interactions with nature in children and teenagers: a systematic review is research by Suzanne Tillmann, Danielle Tobin, William Alison and Jason Gilliland and is published in the Journal of Epidemiology and Community Health. This entry was posted in Research and tagged Children, Children's Health, Depression, Environment, Happiness, Mental health, Nature, Neighbourhood, Resilience, Self-esteem, Stress on September 18, 2018 by Christine Garrington. As the Royal Society for Public Health launches its #ScrollFreeSeptember campaign, encouraging people to take a break from social media, Professor Yvonne Kelly from the ESRC International Centre for Lifecourse Studies at UCL, discusses new research on the negative impacts of social media use on young people’s health. She explains how the findings point to the need to limit the time that young people, especially girls, spend on social media. The ScrollFreeSeptember campaign accompanies the launch of a second parliamentary inquiry in less than 12 months into the impact of social media use on young people’s mental health and well-being. Our Centre will be submitting a range of important new findings to that inquiry which seeks to grow the evidence base in an area where there is a great deal of hot debate, but where little is really known and understood. For our team of researchers, the first indication that all was not well in the world of social media and young people’s mental health came in 2015 when we found that children who were heavy users of screen-based media were less happy and had more social and emotional problems than their peers who used it moderately. Children who used social media sites for chatting were also less likely to be happy and more likely to have problems than their peers who did not. In March this year, our widely covered work on the trends for boys’ and girls’ social media use added weight to recent calls from the Children’s Commissioner for England to, as she put it, call time on a “life of likes”. In her report, Anne Longfield argued that there was clear evidence of children finding it hard to manage the impact of online life. She said children as young as eight were becoming anxious about their identity as they craved social media likes and comments for validation. Our research, based on the experiences of 10,000 children aged 10-15 who took part in the Understanding Society study, showed that this seemed to be the case particularly for girls who used social media for more than an hour a day. 10 year-old girls in the study who spent an hour or more on a school day chatting online had considerably more social and emotional problems later on – by age 15 – than girls of the same age who spent less or no time on social media. The number of problems they faced also increased as they got older, which was not the case for boys. It was interesting to note that more girls than boys were using social media and for greater periods of time. At age 15, 43 percent of girls and 31 per cent of boys were using it for between one and three hours per day, with 16 and 10 per cent using it for more than four hours. We think this tells us something important about the different ways that girls and boys interact with social media. For example, girls may be more likely than boys to compare their lives with those of friends and peers – whether those are ‘filtered’ selfies or positive posts about friendships, relationships or material possessions – these could lead to feelings of inadequacy, lower levels of satisfaction and poorer wellbeing. Boys are more likely to be gaming than interacting online in the way just described and that wasn’t covered in this research, so it’s possible that for boys, changes in well-being may be more related to gaming success or skill. 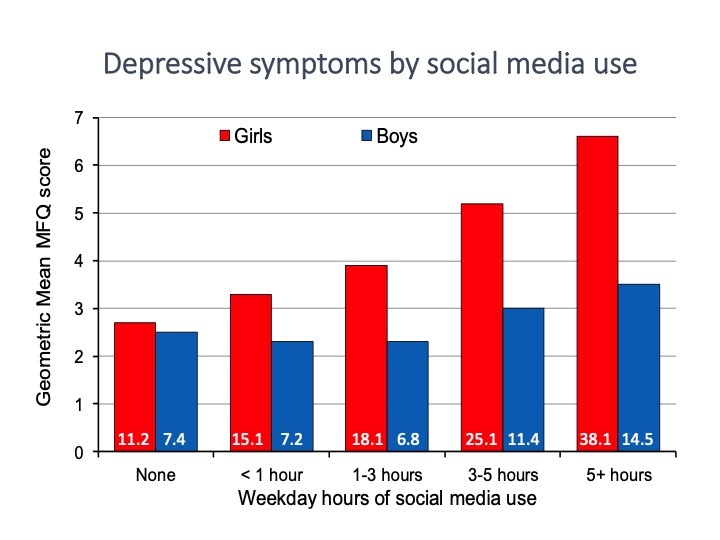 More recently, we have turned our attention to the social media experiences of the children in the Millennium Cohort Study (MCS), using information on 11,000 14 year-olds to look at how social media use is linked with depression. We’ve also been asking ourselves what the pathways between these two things might look like, something that’s not really been done before. 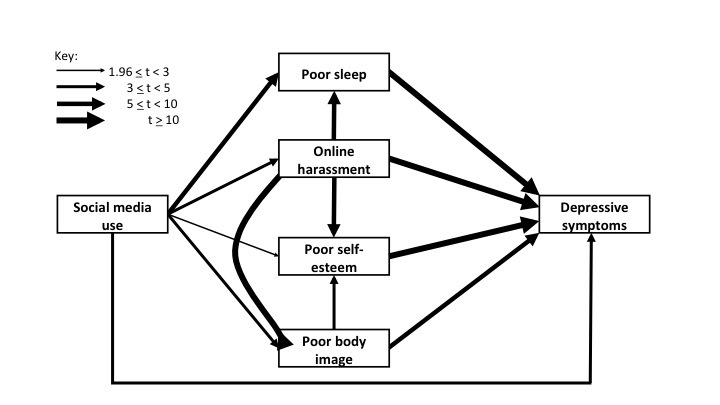 So, for example, are heavier users of social media getting too little sleep or having trouble getting to sleep because they are checking accounts at bedtime; are they experiencing cyberbullying either as victims or perpetrators; do they appear to have low self-esteem or a negative view of how they look? All these questions can help us better understand what’s at play and come up with better approaches to tackling these problems. Preliminary findings reinforce the message that girls are particularly vulnerable to the negative effects of social media. Once again we see more girls than boys in this study using social media and for longer periods of time. Does using social media affect literacy? A follow up piece of research looks at whether there are links between the amount of time young people spend on social media and their levels of literacy. Findings suggest a link and that this is the same for boys and girls. In this research we look at whether the more time young people spend on social media, the less time they have for the things that might improve their literacy such as reading for enjoyment and doing homework. Social media companies have been accused by the former Health Secretary Jeremy Hunt among others of turning a blind eye to the problem and the chief medical officer Dame Sally Davies has been asked to recommend healthy limits for screen time. Our research indicates that it may indeed be time for recommended healthy and safe limits of social media use, that a focus on girls, especially initiatives to boost their mental health could help mitigate some of the negative effects. The RSPH is hoping that going scroll free this September might give us all a chance to get our social media use a little more balanced, to think about the benefits to be enjoyed and the negatives to be avoided. As well as pausing to think about our social media use and how it affects us, it will be an opportunity to examine the facts of the matter, a time to digest new, solid evidence that these large scale studies can help us with and consider the potential longer term costs and consequences of doing nothing. The forthcoming inquiry hopes to inform “progressive and practical solutions”, including a proposed industry Code of Practice and tools for educators, parents and young people themselves to help them enjoy the benefits and eliminate the negative effects of their social media. We wholly support those efforts and hope they result in positive changes that will make campaigns like ScrollFreeSeptember unnecessary in the future. This entry was posted in Research and tagged Adolescent, Children, Children's Health, Development, Evidence, Happiness, Health, Mental health, Millennium Cohort Study, Screen time, SDQ, Social media, Socio-emotional difficulties, Understanding Society, Well-being, Young people on July 27, 2018 by Christine Garrington. By 2050, it is said that obesity could cost the NHS almost £10 billion a year, with the full economic cost rising from around £27 billion today to £50 billion by then. Today, the Centre for Social Justice (CSJ) publishes its report, Off the scales: time to act on childhood obesity. It calls on the Government to put prevention, health, inequality and cross-departmental collaboration at the heart of its efforts to tackle childhood obesity, drawing particular attention to the need to address the question of why poorer children are at ever greater risk of being obese. It’s a question researchers at the ESRC International Centre for Lifecourse Studies at UCL, including our editor Yvonne Kelly, have been among the first to address. There have been numerous major studies on childhood obesity over the past 10 years, many of which have shown the links with poverty. But our research looks specifically at why children from disadvantaged families are significantly more likely to be obese than their better off peers. To examine this as robustly and rigorously as we could, we used data from the Millennium Cohort Study (MCS) which has tracked the lives of nearly 20,000 children from across the UK since the turn of the century. Using a range of measurements taken when the children were aged 5 and 11 together with detailed information about their backgrounds and family circumstances, we were able to demonstrate just how key poverty was in respect of their obesity. 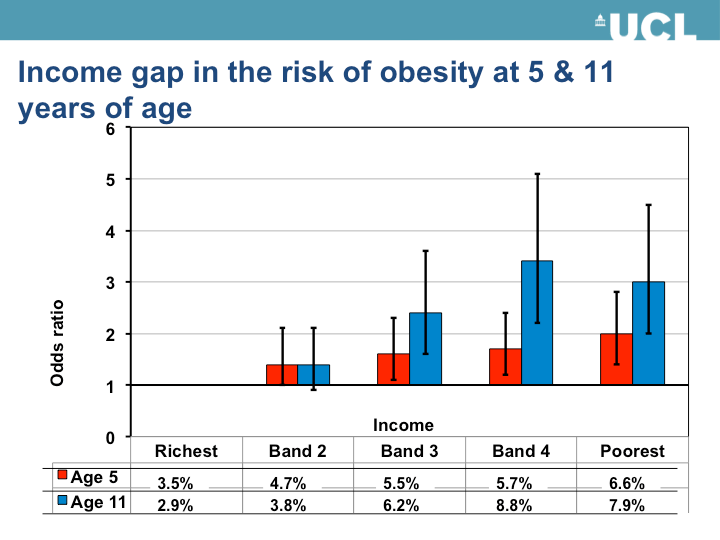 At age 5, poor children were almost twice as likely to be obese compared with their better off peers. By the age of 11, the gap had nearly tripled. Knowing as we do that obese children are less likely than their peers to grow into economically successful adults and that obesity is clearly linked with a range of chronic diseases, it’s reasonable to say that for these children, the future is far from bright. From a policy perspective it is also clear that unless the gap between rich and poor children can be closed the chances of reducing the overall obesity trend, as the Government states it is committed to doing, are pretty slim. How is poverty linked to obesity? The MCS collects a broad range of data, allowing us to dig beneath these headline numbers to tease out some of the specific ways in which relative poverty in childhood leads to an increased risk of obesity. To examine this question of whether a parent’s own lifestyle might have a role, we looked at factors previously shown to be linked to the increased risk of obesity, such as whether the mother smoked during pregnancy, how long she breastfed for and whether the child was introduced to solid food before the age of four months. We could also factor in the degree to which a mother was herself overweight or obese and assess children’s physical behaviour, such as how often they exercised, played and how many hours they spent watching TV or playing on a computer, and the time that they went to bed. We looked at whether the child skipped breakfast, how much fruit they ate and how often they had sweet drinks. A lot of these factors were relevant. A mother’s behaviour when her child was very young was certainly important. Markers of an ‘unhealthy’ lifestyle here could mean as much as a 20 per cent additional risk of obesity for a child. Obese and overweight children living in poor families were more likely to have mothers who did not breastfeed or breastfed for a shorter duration, who introduced solid foods early in infancy, who smoked during pregnancy, and who were overweight or obese. The poorest children were also more likely to spend more time watching TV and using a PC (and so have greater exposure to food and drink advertising), experience later and more irregular bedtimes, do less sports and be more physically inactive, engage less in active play with their parent, live in an area without a playground, and not have breakfast every day. 5-year-olds from poorer families were also much more likely to gain excess weight up to age 11 than richer children, leading us to conclude that the earlier certain risk factors can be challenged and the appropriate support provided for the least well off families, the greater the chance of positive impact on the risk of obesity and in a reduction in inequality. 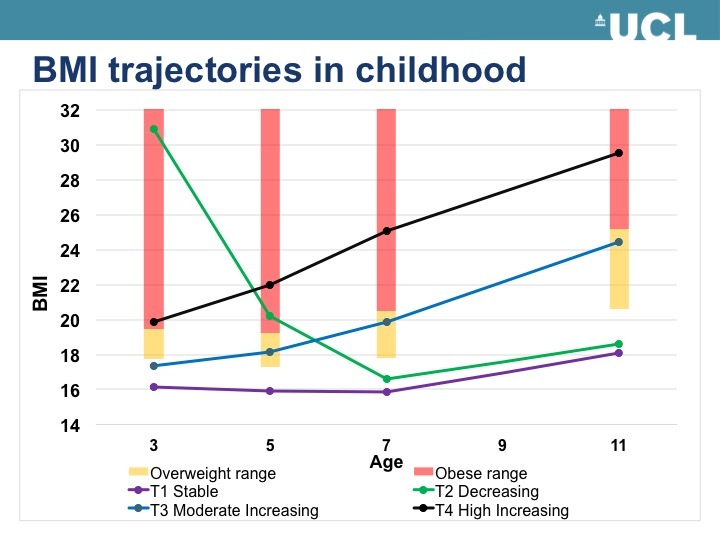 More recently we have identified four BMI trajectories for children. The good news is that 80 per cent of them are on a stable path where, on average, from when they’re born through to age 11, they are not overweight. There is a small group of children who are obese at age 3 but then join the stable group by age 7. We call them the ‘decreasing’ group. There is a ‘moderate increasing group’ (13.1 per cent) where children are not overweight at age 3 but whose BMIs increase throughout childhood into the overweight (but not obese) range. Finally we have a ‘high increasing’ group of children (2.5 per cent) who are obese at age 3 and whose BMI continues to increase. From an inequality perspective, what’s most striking here is that the wealthiest children are least likely to be in the ‘moderate increasing’ BMI group whilst the poorest children are more than twice as likely to be on the high increasing path. Today’s CSJ report agrees with our analysis that early intervention is key and, in line with it, proposes three key early years intervention opportunities to ensure children get the healthiest start possible before they reach primary school age. Certainly our body of evidence indicates that policy makers need to acknowledge and address inequality as a root cause of obesity. Doing something about the structural factors in people’s lives is what is needed rather than ‘tinkering around the edges’ of the problem. Today the CSJ asks why there are disproportionately high levels of obesity, particularly childhood obesity, in our most deprived communities. Our research has gone some way to answering that question, and makes it clear that there is no simple one-stop shop solution. Obesity is caused by a combination of environmental, biological, cultural and psychological factors, where one factor does not dominate and yet our obsessional search for the ‘one thing’ that can tackle obesity continues. If the Government is going to reduce obesity rates, it will indeed, need to introduce multiple bold measures in tandem across the entire ecosystem and recognise that success may only be measurable after a few years. This entry was posted in Research and tagged Babies, Children, Children's Health, Development, Diet, Equality, Happiness, Health, Inequality, Maternal health, Millennium Cohort Study, Nutrition, Obesity, Overweight, Physical Activity, Well-being on December 7, 2017 by Christine Garrington. The very best of sleep medicine and research is being presented at the World Sleep Congress in Prague this week. Among that research are findings from work by Child of our Time Editor, Professor Yvonne Kelly and colleagues at the ESRC International Centre for Lifecourse Studies. They have been trying to find out what it is about sleep that matters most when it comes to giving children the best possible start in life. Here Yvonne explains what they have found to date and why regular bedtimes are key to a healthy happy childhood. What happens in the early years has profound implications for what happens later on in life. Thousands of research papers, many of them using the wonderful rich data in the British Birth Cohort studies, have documented the enduring impacts of the way we live our lives as children on how we fare later on. Children who get a poor start in life are much more likely to experience poor outcomes as adults, whether that’s to do with poor health or their ability to enjoy work and family life later on. So what has all that got to do with getting enough sleep as a toddler you might ask? Well our research shows it is one of a number of important factors related to getting children off to the best possible start in life and here’s why. The National Sleep Foundation recommends that toddlers should get around 11 to 14 hours sleep every day. For 3-5 year-olds, the recommendation is 10-13 hours and it suggests 9-11 hours for children once they’re at primary school. But is it all about the number of hours sleep children get, or is there more to it than that? Those are the questions we have been addressing in our research into children’s sleep and how it ties in with how they get on at home and at school across the first decade of their life. Digging into one of those studies mentioned earlier, the Millennium Cohort Study, which has followed the lives of some 20,000 children since the turn of the century, we found that it’s not just the number of hours a child sleeps that matters, but also having consistent or regular bedtimes. First we looked at the relationship between regular and irregular bedtimes and how the children got on in a range of cognitive tests. The results were striking. Children with irregular bedtimes had lower scores on maths, reading and spatial awareness tests. Parents who took part in the MCS were asked whether their children went to bed at a regular time on weekdays. Those who answered “always” or “usually” were put in the regular bedtime group, while those who answered “sometimes” or “never” were put in the irregular bedtime group. Interestingly, the time that children went to bed had little or no effect on their basic number skills, and ability to work with shapes. But having no set bedtime often led to lower scores, with effects particularly pronounced at age three and the greatest dip in test results seen in girls who had no set bedtime throughout their early life. The key to understanding all this is circadian rhythms. If I travel from London to New York, when I get to there I’m likely to be slightly ragged because jet lag is not only going to harm my cognitive abilities, but also my appetite and emotions. That’s for me, an adult. If I bring one of my children with me and I want them to do well at a maths test having just jumped across time zones, they will struggle even more than I will. The body is an instrument, and a child’s is especially prone to getting out of tune. The same thing happens when children go to bed at 8 p.m. one night, 10 p.m. the next and 7 p.m. another — we sometimes call this a “social jet lag effect.” Without ever getting on a plane, a child’s bodily systems get shuffled through time zones and their circadian rhythms and hormonal systems take a hit as a result. Having established the importance of sleep to a child’s intellectual development, we turned our attention to the relationship between regular bedtimes and their behaviour. At age 7, according to parents and teachers, children in the MCS who had irregular bedtimes were considerably more likely to have behaviour problems than their peers who had a regular bedtime. In addition, the longer a child had been able to go to bed at different times each night, the worse his or her behaviour problems were. In other words the problems accumulated through childhood. One really important piece of good news was that we found that those negative effects appeared to be reversible, so children who changed from not having to having regular bedtimes showed improvements in their behaviour. There seems to be a clear message here that it’s never too late to help children back onto a positive path and a small change could make a big difference to how well they get on. Of course, the reverse was also true so the behaviour of children with a regular bedtime who switched to an irregular one, worsened. In a follow up study, which looked at the impact of routines including bedtimes on obesity, we reported that children with irregular bedtimes were more likely to be overweight and have lower self-esteem and satisfaction with their bodies. In fact, of all the routines we studied, an inconsistent bedtime was most strongly associated with the risk of obesity, supporting other recent findings which showed that young children who skipped breakfast and went to bed at irregular times were more likely to be obese at age 11. So we have a body of robust evidence now that shows very clearly that regular bedtimes really matter when it comes to a child’s health and development over that important first decade of their life. Providing that evidence in the form of advice to parents and all those caring for young children alongside recommended hours of sleep could make a real difference, helping protect our children from ‘social jet-lag’ and getting them off to a flying start instead. Changes in Bedtime Schedules and Behavioral Difficulties in 7 Year Old Children is research by Yvonne Kelly, John Kelly, Amanda Sacker and is published in Pediatrics. 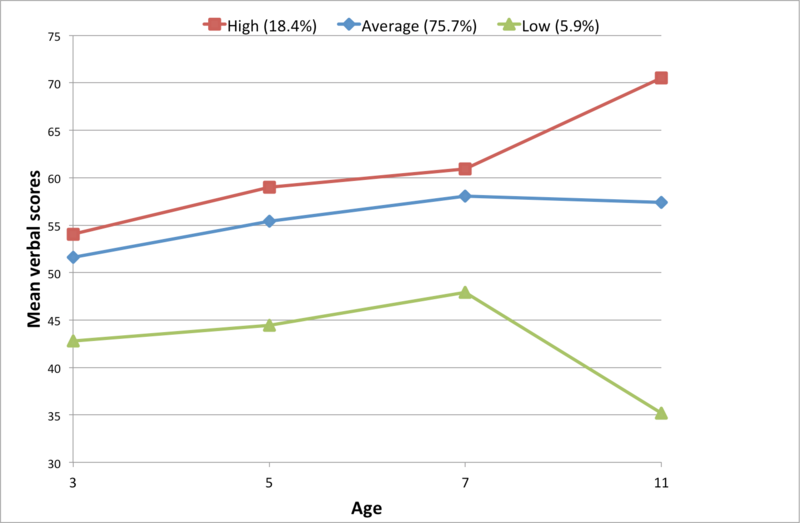 Time for bed: associations with cognitive performance in 7-year-old children: a longitudinal population-based study is research by Yvonne Kelly, John Kelly, Amanda Sacker and is published in the Journal of Epidemiology and Community Health. This entry was posted in Research and tagged Babies, Bedtimes, Children, Children's Health, Development, Diet, Evidence, Happiness, Health, Millennium Cohort Study, Obesity, Overweight, SDQ, Sleep, Socio-emotional difficulties, Well-being on October 10, 2017 by Christine Garrington. A growing body of research is pointing to how important and valuable reading is in giving children the best possible start in life, not just for academic success but more broadly including for a child’s mental health and happiness. In this special episode of the Child of our Time Podcast, Professor Yvonne Kelly is joined by Jonathan Douglas, CEO of the National Literacy Trust and researcher Christina Clark, also from the Trust. They discuss important new evidence about the benefits of reading for individual children and in addressing social inequalities. Do mental health problems have their roots in the primary school years? This entry was posted in Research and tagged Adolescent, Babies, Bedtimes, Children's Health, Development, Discrimination, Equality, Evidence, Happiness, Health, Inequality, Literacy, Millennium Cohort Study, Reading, SDQ, Smoking, Socio-emotional difficulties, Well-being, Young people on August 31, 2017 by Christine Garrington. Recent reports have shown worrying rises in young people suffering from mental health problems. A study for the Department of Education showed more than a third of teenage girls reporting depression, anxiety and low self-esteem. To try to understand this growing problem, Dr Afshin Zilanawala and fellow researchers from the ESRC International Centre for Lifecourse Studies at UCL have investigated how certain aspects of learning in the primary school years and success affect the behaviour and wellbeing of early adolescents. Young people who drink, smoke and have behavioural problems are known to be at risk of suffering poor health as adults. Understanding what causes this risky behaviour, and the anxiety and low self-esteem associated with it, can help professionals to target those most likely to drop out of school, become pregnant as a teenager, become obese or to suffer other long-term health issues. By planning support and prevention programmes during childhood, they can improve the likelihood of a successful and healthy adulthood for our most vulnerable young people, and reduce the pressure on health and social services. A recent YouGov survey of Britain’s university students revealed that more than a quarter of them report depression and poor mental health. But could the roots of these problems be found by looking more closely at how children develop and learn throughout the primary school years? Information on more than 11,000 children collected by the UK Millennium Cohort Study (MCS) was used in our research, which explores the links between children’s verbal abilities and their behaviour and well-being as they make the move to secondary school. Using information collected at ages three, five, seven and 11, we were able to see how well they could read, the range of their vocabulary and their verbal reasoning skills. Then, at age 11, the children were asked about their school work and life, their family and friends and their appearance. There were questions about how happy they were, whether they felt good about themselves. They were also asked if they had tried cigarettes or alcohol, and if they had stolen anything or damaged property. In terms of how well they were getting on, the children were divided into three groups (low, average and high verbal achievers). This in itself produced a startling and worrying view of the diverging paths these different children follow over time, particularly between the ages of seven and 11. One in five of the children (the high achievers) did better and better at the verbal tests, stretching away from their peers as they prepared to head to secondary school. The majority (around three quarters) of children were on the middle path, making steady progress but then plateauing off. But, most striking of all was what happened to the low achieving group (around one in 17 of the children), whose verbal abilities declined steeply. Having established these pathways, we went on to look at which children at age 11 were involved in risky behaviours and then to dig deeper to see how these behaviours related to their progress to date. We also looked at what other factors, especially those related to their family circumstances, might be at play. Boys were more likely than girls to be smoking and drinking or getting involved in anti-social behaviour. Girls were more likely to suffer from low self-esteem. First-born children were happier and had higher self-esteem, and were less likely to smoke, drink and have problem behaviours than second or later birth-order children. Children with younger mums were also more likely to engage in risky behaviour. Those from disadvantaged backgrounds and those with more unsupervised time were more likely to suffer from poor mental health. We also found those whose mothers suffered from depression were more at risk of mental health problems. Looking at the raw data, the low achieving children were three times more likely to smoke than their high achieving peers and twice as likely as the average group. Low achieving and average achieving children were also more likely to drink. One in three of the low achieving children compared with one in five of the high achievers had been involved in anti-social behaviour and were more than four times more likely to have behaviour problems as reported by their parent. They also had much lower levels of self esteem. When we took a range of family factors into account including the child’s age and gender, mother’s age and mental health and socioeconomic circumstances, many or all of the differences between the groups disappeared or became smaller, confirming the overriding importance of the family and social environment. However, we can say, for the first time, and with considerable confidence, that how well children are reading, talking and reasoning, can and does influence their health and well-being as they become adolescents. Indeed, we found clear evidence that children who were performing below average in this area across childhood were more at risk of poor mental health and risky behaviour than their consistently above-average performing peers. If we want those children to stand a better chance of a healthy and happy life, we need to focus a great deal of attention on what is happening at home and at school in those early years, particularly, our research would seem to show, between the ages of 7 and 11. Our results are consistent with other research, which demonstrates the huge challenge for young people with poor verbal skills, who arrive at the doorstep of adolescence with mental health, self-esteem and behavioural issues, which are likely to continue into adult life. Recent reports that child poverty figures in the UK are continuing to rise, despite successive Governments’ promises to reduce them, does not bode well in this context. Indeed, it would seem to indicate that it will be some time before the yawning gaps in inequality that we see at primary school and their knock-on effects on children’s wellbeing in adolescence can be closed. This entry was posted in Research and tagged Adolescent, Alcohol, Children, Cognitive profiles, Development, Education, Family, Happiness, Mental health, Millennium Cohort Study, Primary School, School, Smoking, verbal reasoning, Well-being, Young people on July 19, 2017 by Christine Garrington.